It’s a winning combination that makes Thomas Corner eatery equally popular with both visiting and local foodies. Our menu is focused around fresh, local and seasonal produce. We’re fortunate to have a dazzling variety of produce available to us on the Sunshine Coast, including tropical fruits, nuts, vegetables, meat and, of course, our beautiful seafood. These local ingredients are the key to our dining experience, carefully combined to create simple, innovative dishes with fresh, dynamic flavours. Thomas Corner eatery is a family-owned business created by our head chef David Rayner. After starting his career in London as an apprentice at The Savoy Hotel, David found acclaim in Sydney where he was first awarded his first Chefs Hat award in the Sydney Morning Herald Good Food Guide. After moving to Noosa, David was appointed Head Chef at Berardo’s Restaurant. During his time there it was awarded Queensland’s Best Regional Restaurant by the Australian Gourmet Traveller. David created Thomas Corner eatery to bring his vision of serving clean, fresh food in a modern setting on the Noosa River to life. What started as a labour of love to offer locals and tourists everything we really want in a Noosa dining experience, remains a creative outlet where David can constantly experiment by adding new twists to his favourite creations. We are open for breakfast, lunch and dinner with bar snacks available in the afternoon for those who just want to enjoy a drink overlooking Gympie Terrace. Thomas Corner eatery has been designed to reflect our modern, casual and innovative dining experience. The restaurant has an uncluttered, industrial interior but maintains the laid-back feel holiday-makers flock to Noosa for. You can choose to dine inside for maximum privacy or outside on the spacious deck to make the most of the views over Gympie Terrace and the sparkling Noosa River. Our living garden wall, extends from the inside to outside and provides an impressive backdrop by day and night, come rain or shine. The restaurant and deck are cool and airy throughout the day allowing a relaxed way to enjoy the river breezes in comfort and style. 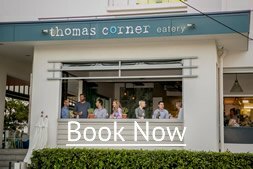 Offering laid-back sophistication and a humming atmosphere, Thomas Corner eatery is suitable for a quiet meal with friends or special dates like birthdays, wedding anniversaries and family reunions. 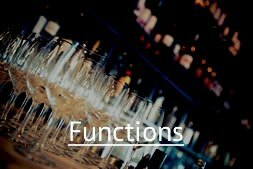 We also cater for events including weddings and business functions, with group bookings available for small parties of 13 to 25 guests or exclusive restaurant bookings for up to 65 people for a sit-down lunch or dinner or up to 120 people serving drinks and canapés. While competition for the title of best restaurant in Noosa has always been stiff, we set the bar high and our loyal clientele and favourable reviews, from both restaurant critics and the general public, prove we’re doing something right. Call us now to make a booking or use our booking form. Why do people love Thomas Corner? OMG!!!! I saw reviews on trip advisor which helped me decide to book this restaurant. Amazing location, delicious food& drink, spoilt for choice & excellent service !!! Everything was fresh & tasty and came presented beautifully ….. Thomas Corner Eatery is up there with the best in the Sunshine Coast! I will definitely be back next time I’m in town !